The perfect holiday gift for the whiskey lover in your life! Avoiding the deliberately obscure, the ridiculously limited, and the absurdly expensive, whiskey expert Ian Buxton has scoured the shelves of the world's whiskey warehouses to recommend an eclectic selection of old favorites, stellar newcomers, and mystifyingly unknown drams that simply have to be drunk. This witty, focused, and practical guide is not an awards list or a list of the 101 "best" whiskies in the world in the opinion of some self-appointed whiskey guru. It's simply a guide to 101 whiskies from around the world that enthusiasts really must seek out and try—love them or hate them—to complete their whiskey education. What's more, it's both practical and realistic as it cuts through the clutter, decodes the marketing hype, and gets straight to the point; whether from India or America, Sweden or Ireland, Japan or the hills, glens, and islands of Scotland—here are the 101 whiskies that every whiskey enthusiast needs to try. 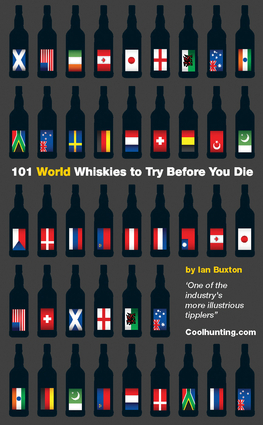 Ian Buxton is a former marketing director of Glenmorangie and the author of 101 Whiskies to Try Before You Die. He was elected a Keeper of the Quaich in 1991, the highest honor of the Scotch whisky industry; he is a member of the international tasting panel for the annual World Whiskey Awards; and he is a liveryman of the Worshipful Company of Distillers. He writes regular columns for the Keeper, Whisky Magazine, and WhiskyEtc magazine, and has written for the Country Life, Scottish Field magazine, and the Times.